Isidore (c.560-636) was bishop of Seville, and perhaps the most learned man of his age, and author of numerous works. The 'Three Books of Sentences' is a compendium of moral and dogmatic theology, drawn largely from the writings of St. Gregory the Great and St. Augustine. 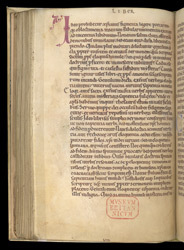 Several inscriptions show that this manuscript was owned by the Cluniac abbey of St. Saviour's, Bermondsey, a short distance south-east of the Tower of London. Purple as a colour was used for decoration in the twelfth century, but became uncommon in the thirteenth. This initial, with its simple decorative motifs, is of a type characteristic of manuscripts made in the West Country. At the lower edge of the leaf is the quire number 8, in roman numerals.